While in Okinawa, don't miss out on Main Island Enjoy Pass and Okinawa World and Culture Workshop Experience! Good good good good good good very fast nice amazing . . . . . . . . . . . It's never been so easy to stay connected whilst abroad. 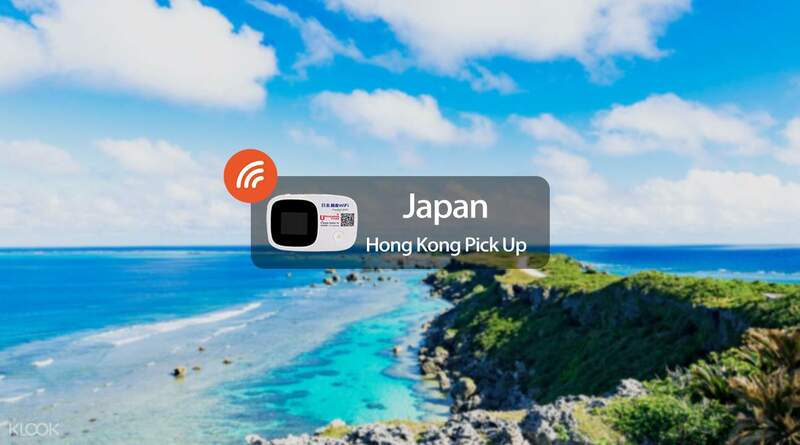 With an easy pick up and drop off service at Hong Kong International Airport, you'll enjoy unlimited WiFi access throughout your stay in Japan, without the stress of sourcing WiFi once you get there. The speedy 4G device connects up to five different phones, laptops and tablets at once and supports 4-6 hours of surfing on one battery charge. So add some spontaneity to your travels with the ability to plan on the go and keep in touch with friends and family wherever you are. Whether you're arriving in, or leaving Hong Kong for another destination in Asia, we've got you covered with WiFi pick up at Hong Kong Airport for holidays not only in Japan but also Thailand, Singapore, Taiwan and Korea. The WiFi is quite smooth and fast for the whole journey. It is fast enough for me to access to the google map for driving navigation. However, the only downturn is that the battery can only last for half day . But I would still recommend it. The WiFi is quite smooth and fast for the whole journey. It is fast enough for me to access to the google map for driving navigation. However, the only downturn is that the battery can only last for half day . But I would still recommend it. Easy pick up at Hong Kong Airport Departure Hall. Very good connection in Okinawa (from Naha all the way to Kouri Island). Battery lasted for about 10 hours. Easy pick up at Hong Kong Airport Departure Hall. Very good connection in Okinawa (from Naha all the way to Kouri Island). Battery lasted for about 10 hours. Very convenient to collect the wifi egg, the egg can be used in Osaka easily. There was no queue when I collected the wifi egg. Cheap and reliable. I will come back for sure. The only deficit is, the wifi egg can be used for 6 hours only. An external charger is a must. Very convenient to collect the wifi egg, the egg can be used in Osaka easily. There was no queue when I collected the wifi egg. Cheap and reliable. I will come back for sure. The only deficit is, the wifi egg can be used for 6 hours only. An external charger is a must. Collection of the wifi device at Klook's Mong Kok centre was smooth and professional. My return flight from Ishigaki Japan to Hong Kong was cancelled because of the super typhoon Trami and I was therefore involuntarily forced to stay there for a couple of days. I reached out to Klook immediately to request for an extended use of the wifi device and their reply was speedy. However, Klook should have directed me to contact Uroaming the service provider directly to explain the situation as I was finally charged at the standard rate for the extra days instead of the promotion rate. Collection of the wifi device at Klook's Mong Kok centre was smooth and professional. My return flight from Ishigaki Japan to Hong Kong was cancelled because of the super typhoon Trami and I was therefore involuntarily forced to stay there for a couple of days. I reached out to Klook immediately to request for an extended use of the wifi device and their reply was speedy. However, Klook should have directed me to contact Uroaming the service provider directly to explain the situation as I was finally charged at the standard rate for the extra days instead of the promotion rate. Staff was nice. I went Ishigaki and Taketomi. The wifi worked in most places, even rural areas, but certainly the signal was not as strong in the town center. Staff was nice. I went Ishigaki and Taketomi. The wifi worked in most places, even rural areas, but certainly the signal was not as strong in the town center. Good wifi tools for the trip, battery long lasting and all cable and machine in good condition. Good wifi tools for the trip, battery long lasting and all cable and machine in good condition. Easy redemption but battery capacity is not enough for whole-day usage. Easy redemption but battery capacity is not enough for whole-day usage. can use up to 8-10 hours if fully charged. easy to connect. highly recommended! can use up to 8-10 hours if fully charged. easy to connect. highly recommended!